Rapper Kendrick Lamar is SZA's number one fan at the MTV Video Music Awards this year (17). 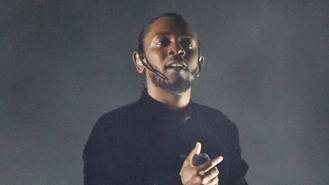 Kendrick is the leading nominee at Sunday's (27Aug17) prize-giving with eight nominations and ahead of the ceremony he has nothing but praise for his Top Dawg Entertainment record labelmate SZA, insisting the R&B singer's debut album CTRL is a "masterpiece" she deserves to win a prize for. SZA has received her first major award nomination ever after earning a VMAs nod in the Best New Artist category, where she will be competing against Noah Cyrus, Khalid, Kodak Black, Young M.A. and Julia Michaels for the prize. Kendrick is so impressed with SZA's work, he jumped at the chance to appear on her new song Doves in the Wind, and he's keeping his fingers crossed they'll be shooting a music video for the tune soon. Kendrick will rock the stage at the 2017 MTV Movie Awards by performing his two songs Loyalty and Humble from his hit album DAMN.